Walsh Country Store will deliver your shed to the site of your choice. 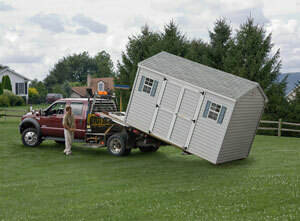 Prior to delivery, the site for your shed must be properly prepared to receive the shed. Your shed requires a level lot for proper installation. This will eliminate problems with shifting and leaning which may cause structural problems down the road. To prepare your shed site, some digging may be required to eliminate uneven grades or humps. After you have leveled the surface, you can finish your shed base with concrete or gravel / crushed stone. While concrete provides a more solid base, gravel or crushed stone is easier to install, drains well and is very inexpensive. We do not recommend cinder blocks as the foundation for your shed. After your shed is in place some settling will occur and cinder blocks may cause your shed to settle unevenly. Delivery is also more difficult when placing the shed on cinder blocks than placing it on a flat concrete or crushed stone surface. Use 3/4" crushed stone, about 2-3" deep. Lay out in an area 1 foot larger than the perimeter of the shed. This will allow for proper drainage around the perimeter of the shed for rain and snow melt that will drip from the eaves. As for preparing a gravel base, clear the sod from an area greater than that of the dimensions of your shed. Level the site by clearing dirt, rocks etc. where it is necessary. Spread the gravel until you achieve a depth of 3 inches. Use a metal tamper or 4x4 to tamp down the gravel stone until it is evenly distributed and your site is level and flat. Need Help with Site Prep? We can do the site prep for you! If you're not sure how to prepare your site or would just prefer not to do the job yourself, we can take care of site prep for you. Ask us about additional charges for this service.